The Global Color Research team is back in the office off the back of another hugely successful Surface Design Show! 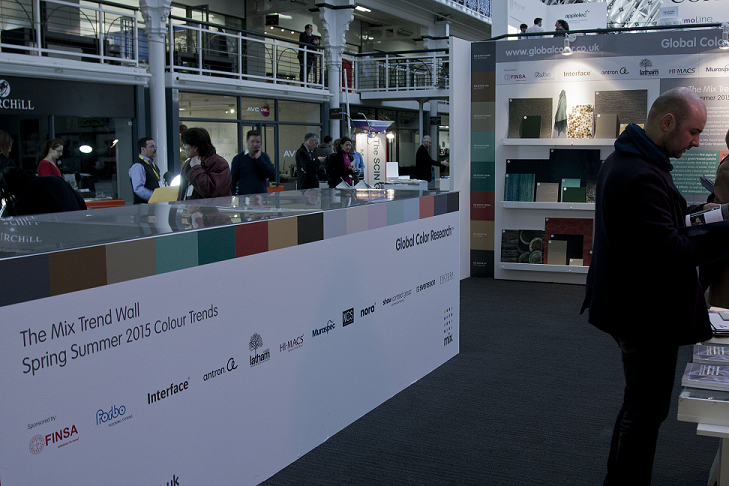 This year we presented our colour trend themes for Spring Summer 2015 Glade and Aura on our Mix Trend Wall. Using real life samples given to us by our sponsors we were able to bring our trend stories to life and show their diverse application to surface and material design. 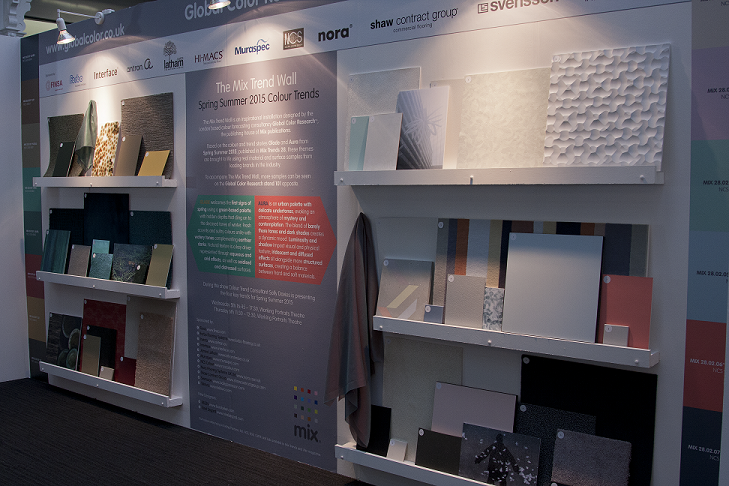 The Mix Trend Wall showcased an exciting collection of samples from companies who are at the forefront of material and surface innovation. In Glade natural texture was a key driver with aqueous effects captured in Tektura’s wallcovering, Svensson’s high sheen fabric, and Nora’s rubber flooring. In contrast, arid effects translated into calming pattern and colour ways in carpeting by Shaw Contract Group, Interface, and Invista. This soft flooring perfectly complemented solid colour laminates by Finsa and vinyl flooring by Forbo Flooring Systems. Together this mixture of samples represented Glade with fresh accents and sultry shades, highlighted by NCS Colour and James Latham/Hi-Macs, uniting in a truly tactile outcome. The second story brought to life was Aura, and with its play between luminosity and shadow we came across some really exciting products. Iridescent effects were key, seen in Muraspec’s wall cladding and Tektura’s wallcoverings. Ethereal light tones dominated hard surfaces while a more urban element inspired moodier dark colours in carpeting by Interface, Shaw Contract Group, and rubber flooring by Nora. This mixture of light and dark colours in one trend was given a real identity through the samples sourced, inspiring visitors to approach colour and material in a much more dynamic way. We’d like to take this opportunity to thank each and every one of our sponsors for making this year’s Mix Trend Wall such an excellent installation. Along with the Mix Trend Wall our colour trend consultant Sally Davies presented seminars on all four of our colour trend stories for Spring Summer 2015 Glade, Aura, Merge and Belong. For all those who attended we really hope that you enjoyed as we explored these colour themes in detail and their application to surface design. To catch up with our upcoming seminars please click here. 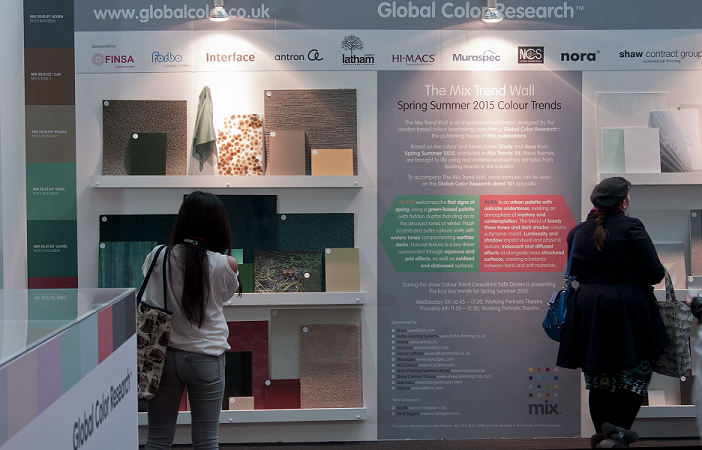 If you would like some more information on the samples from the show or to be a part of the Mix Trend Wall in the future then please contact us at marketing@globalcolor.co.uk. Make sure you catch the official Surface Design Show and Mix Trend Wall review in the upcoming issue 34 of Mix magazine available from 21st of March at www.globalcolor.co.uk. This entry was posted on 11/02/2014 by mixmarketingupdates and tagged aura, Belong, Carpets, colour, flooring, Glade, Global Color Research, Merge, mix magazine, Mix Trend Wall, Mix Trends, Spring Summer 2015, Surface Design Show, surfaces, tiles, Trends.